This trio of stunning gold holiday pine cones have been place dramatically onto a black glass surface to create a mirror like reflection of art. 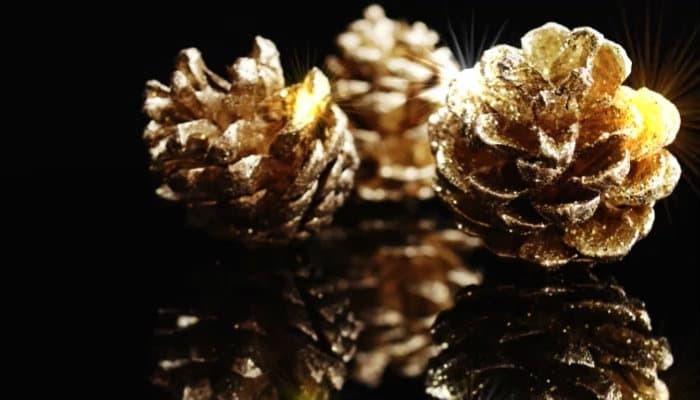 The effect is truly captivating and as you look at the pine cones you realise they have been covered in gold glitter which sparkles and dazzles. The gold is almost like a paint that covers the pine cones completely and as the card plays, they twinkle and shine. The holiday ecards for business also have soft white snow falling around the pinecones as additional animation when you play the ecards which give this a real festive vibe. Alternatively your business may prefer the image without the snow falling, which is absolutely fine. We can edit the animation for you with pleasure. At Ecard Shack we aim to deliver the best service possible so that you are completely satisfied with your design and how this will look to your customers. We always get extremely positive feedback on our ecards designs, and this design in particular seems to speak volumes to our clients. Our customers always comment on how elegant and chic this image is. If you need to contact us regarding your design or you just need advice, please do not hesitate to contact us at any time, we are always here to help you to create the perfect electronic holiday cards for business.